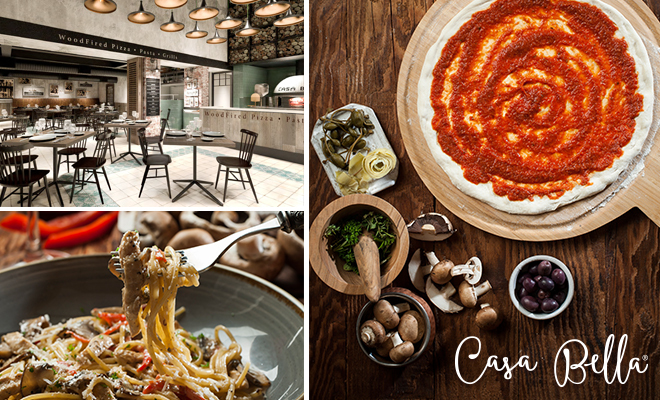 Casa Bella – Wood-Fired Pizza, Pasta, Grills – is an upmarket restaurant brand that seamlessly merges a taste of Italian cuisine with a sophisticated yet friendly dining experience. The brand was launched in 2016 when Spur Group (Pty) Ltd saw a gap in the market for a trendy Italian restaurant that appeals to the more affluent customer. This exciting Italian cuisine focused restaurant will provide franchisees with a unique opportunity to tap into a growing sector. The brand has grown to 7 restaurants located throughout South Africa, located in the Western Cape, Gauteng and KwaZulu-Natal. Offering up fresh meals that are beautifully presented and made from the finest quality ingredients, the menu fuses Italian heritage with contemporary finesse. The result is one which caters for the discerning palate as well as those who enjoy the good, simple and authentic things in life. Think hand pressed pizzas made from imported Italian flour, handmade Durum wheat pasta with fresh sauces made to order. The menu also offers a wide selection of deliciously prepared grills, made the Casa Bella way. All grills are meticulously sourced, expertly aged and delicately prepared giving each one a unique and exciting flavour sensation. With a range of spectacularly prepared grills to choose from, including 2-weeks dry-aged and 1-week wet-aged prime T-Bone Florentina or a delicious serving of Casa Bella Prawns, the grill menu offers something for everyone. To round-off a truly majestic dining experience, Casa Bella offers an extensive, award-winning wine list at reasonable prices. Casa Bella takes pride in offering the best possible wine selection, paired beautifully with their menu, and this was recognised in 2017 and 2018 when awarded with a Platinum Diners Club Award. With its name meaning “Beautiful Home” in Italian, Casa Bella embodies an elegant space with modern finishes and artisanal style details that give it a classy and warm ambience. Gorgeous silver cutlery, glassware and fabric napkins add to the stylish dining experience. Visit the Casa Bella website here.